But life and the NBA doesn’t stop for that. So about 36 hours after Derrick Rose sustained yet another serious knee injury, though this time not quite as severe, the Bulls players had to put it all out of their hearts and minds and commit their skill, energy, effort and enthusiasm to the basketball court. Perhaps the body may be willing, but too often at times like this the mind isn’t able. It seemed so Sunday as the Clippers took a 10-point lead late in the first quarter in a thunderstorm of jump shots, let up some in the second quarter, but then poured it on late in the half and to open the third quarter on the way to a numbing 121-82 win. “It’s not so much we don’t believe in one another and are not going to fight. 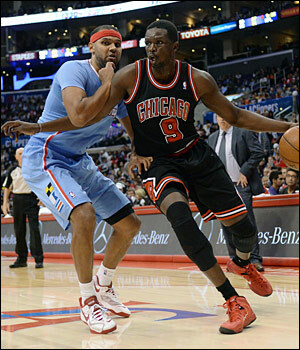 But that’s a good kid and he worked so hard,” said Deng of Rose. Such a defeat was uncharacteristic for this Bulls team that often seems inured to despair. But they hurt and cry like anyone, and as they acknowledged the sympathies for their lost teammate, it was only too clear they were crying on the inside for the kid. “It’s more your little brother got hurt. That’s why everyone’s head’s down,” said Luol Deng, who led the Bulls with 22 points in what was more a going-through-the-motions game for a team that generally symbolizes hard work and effort. But it’s sometimes too much to ask them to smile all the way through the funeral. No, Rose’s career is not dead. He will be back, and those who know him so well on the team also are optimistic for him without faux sympathy. But the shock of yet another knee injury for the kid they love so dearly makes them sick. It’s not as serious this time, a meniscus tear that Rose will have surgery on Monday. It’s not until the surgery is even under way that the surgeons can determine the true extent and appropriate options. They range from perhaps a month out to maybe six, a return into February or perhaps next fall. So the players know what they have to do, but they are not machines. They feel and they hurt, and it wasn’t unlike that second playoff game in 2012 after Rose was injured. The shock remained, and as hard as they tried it wasn’t them on the floor as they lost at home by 17. It was almost like they were watching someone else. Like it was Sunday as the Clippers shot 58.5 percent for the game, more than 60 percent in the first half with 32 assists, a relatively poor rebounding team outrebounding the Bulls while also leading in inside scoring. “I thought the whole game we were just terrible defensively,” agreed Deng. But Deng, one of four team captains along with Rose, Joakim Noah and Carlos Boozer and a leading league sportsman, spoke most eloquently about his missing teammate and inspirational player. Deng trailed off a bit as reporters paused around him. It’s been tough for Deng, the senior Bulls player. It could be his final season with the team since he’s an unrestricted free agent after the season. But with Rose’s return, and looking so good—Deng said he felt Rose was playing better despite the statistics since his return than before his ACL injury—Deng, and pretty much everyone else, believed this season could be the one. It’s been almost four years with this group since it basically came together in the summer of 2010. Even the great Bulls title teams didn’t all stay together. Teams basically get a four or five-year window. Make it happen or try again. With Rose out, it’s tough to see yourself in the same situation. They quickly became title contenders to the surprise of most, leading the league in wins in 2011 and 2012. They went to the conference finals against Miami. It looked like it could be the season in 2011-12 until Rose went out the first game of the playoffs, the No. 1 seeded Bulls going on to be upset in the first round. The Utah Jazz is next Monday, the fourth game in five days, the second day of the rest of Joakim Noah the Bulls’ lives. Then Rose missed all of last season. But this team seemed to be a title contender. Pretty much everyone agreed. Miami would have to strain to do it again. There seemed no dominant team. Rose is not out for the season yet, but those dreams became a nightmare Friday night in Portland. Someone wake them up. So there are questions and concerns hovering over the team. Can they hold it together amidst the uncertainty and their own hazy futures? Can they compete as a team, unselfishly, knowing this could be their last run together. That teamwork and effort has been their edge that’s made them generally more successful than their parts. Those questions will be considered and debated as this group goes on. But for now they had to take a moment and reflect. It just so happens the NBA assigned the Bulls to getting up early and entertaining. The mood didn’t seem to strike them despite their best intentions. “Sometimes with athletes and sports, luck has a lot to do with it,” said Deng. “It’s bad luck. It’s not going to change anything. He’s still going to be Derrick; he’s still going to work hard and come back even better. I really believe he was better coming back from that this year. “But when something bad happens to your little brother or family, you put everything else aside,” said Deng. “As much as I love playing with him and how much better we are as a team with him, just hearing that he got hurt I think took the wind out of everyone. I’m not making excuses for this game. But as a human being, you just feel bad. But they just couldn’t quite Sunday and you’ll have to excuse them. Perhaps it will prove an aberration as the Clippers set a franchise record with a 39-point margin of victory. The Bulls would not in this game, though they showed flashes of offense. Uncharacteristically, they could not commit to the defensive end of the game. Though perhaps it makes sense because that’s generally their passion. Though the Clippers, now 10-5, have been a poor defensive team, they have been constructed with perimeter shooters to play off Chris Paul and Blake Griffin with a high scoring offense. The Bulls scored the first basket of the game with Joakim Noah rolling on a pass from Deng, and that would be their last lead. The Clippers ran off seven straight. Jared Dudley made a 20 footer and a three, and then J.J. Redick added a three and a 13 footer and it was 16-8 Clippers. 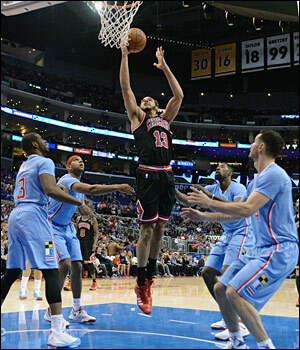 The Bulls, who fell to 6-6 with their third consecutive loss on this trip, were not indifferent. Just somewhat uncommitted. That pretty much covered it. Carlos Boozer and Mike Dunleavy had 14 points each, but Marquis Teague in his full backup role now sputtered shooting zero for seven and was scoreless. Rookie Tony Snell played 27 minutes and played hard. But his aggression often had him biting for pump fakes to leave open shooters. He had five points. The Clippers got 21 points from Dudley, 19 from Redick and 16 points and 17 assists from Paul in 27 minutes. The Clippers, having to start early so the Lakers could play at night in the Staples Center, were playing their fourth game in five days. But they were able to sit all their starters the fourth quarter after leading 96-73. Hey, how ‘bout those Bears! “We have to gather ourselves, prepare ourselves for tomorrow (against Utah),” said Thibodeau. “The games are going to keep coming. Nobody is going to feel sorry for us. I’ve got to do a better job of having them ready to do their job. We have to have an edge about us. I don’t think we had that edge, and that’s on me. “We have to support Derrick and we will,” said Thibodeau. “Derrick has got take care of his rehab and he will. And we’ve got to take care of being ready to play and get the job done on the floor. We have more than enough to get it done. I believe in those guys in that locker room. I know what they are made of. And we’ll get ourselves ready. So perhaps you’ll excuse this one. The Bulls were hanging in trailing 31-24 after the first quarter, shooting 47.8 percent. They got into the second quarter still trailing just 46-41 after a Dunleavy three. Though the Clippers don’t pressure much on defense, they are physical on offense, setting strong screens for the shooters. Paul, Redick and Dudley hit again, Griffin ran out for a score and was fouled hard, but not hard enough, by Kirk Hinrich and scored. Griffin pushed Hinrich, but there was no making the Bulls fight back this time. The Clippers pulled ahead 65-52 at halftime and opened the third quarter with seven straight points on long jump shots, long but open. And though the Bulls still were making nice plays like a Dunleavy touch pass for a Deng three and Boozer slam, the Clippers kept going at it. When it got to 89-69 with about four minutes left in the third and DeAndre Jordan slammed a pass from Paul, whatever helium was holding up the Bulls balloon leaked out and it was over in a few minutes. “We’ve dropped three in a row. We’re going to hear everything in the world of how bad we are and all this stuff,” said Taj Gibson. “We’ve been through a lot. Thibs wrote it down, basically said it does not matter what the outside world says. Even when our backs to the wall we’ve got to strive toward greatness. The Utah Jazz is next Monday, the fourth game in five days, the second day of the rest of the Bulls lives.